Contemporary web design embodies clarity and simplicity, deviating from cluttered layouts full of gaudy graphic elements. Today, even the most loyal fans of loud visual effects do their best to stick to the modern trend of keeping websites clean. To encourage them in their efforts, TemplateMonster professionals have created a minimal yet catchy design for this Free Interior & Furniture Joomla Template. This theme is a versatile solution for a wide range of business fields including interior & furniture, exterior design, architecture, hotels, real estate, fashion, beauty… In fact, the list is too long to all the possible options everything. Just customize the theme according to your company’s needs. Everything is as simple as that. Check it out yourself! Powered by Bootstrap, this free interior & furniture Joomla template comes with a lot of handy options for different purposes. In addition to the rich functionality, it is optimized for search engines, which will bring more visitors to your site. Once web surfers enter it, they will enjoy a perfect image regardless of the devices and browsers they use. This responsive theme works flawlessly in all the current browsers and looks impeccable on screens of desktops, laptops, tablets, smartphones and other devices. So, if you want to run a stylish, powerful and user-friendly site, this free interior & furniture Joomla template is just the job for you. 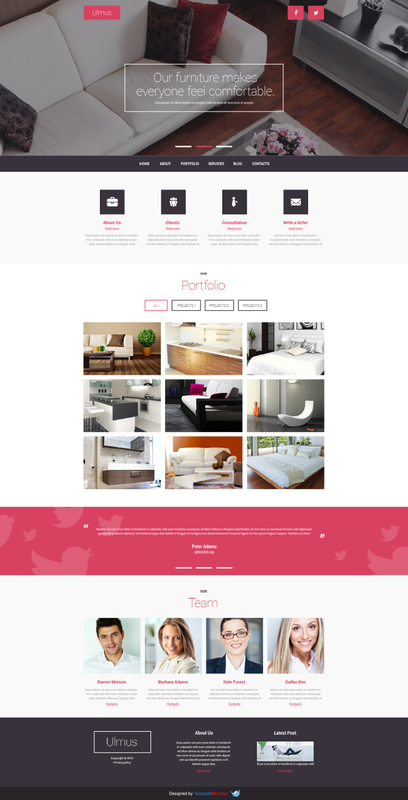 This entry was posted in Free Joomla Templates, Responsive Web Design. Bookmark the permalink.